There is a double opportunity afforded by recent policies that incentivize us to live in smaller spaces at higher densities combined with efforts to provide more environmentally conscious environments. The recent advancements in construction technology are proposing sustainable wood frame structures, affording new ways to build taller. ‘Mass Timber: Micro Unit’ imagines the redevelopment of the Gansevoort Peninsula along the West Side Highway as a mass timber constructed micro-unit tower. Despite the public outcry over increasing income inequality among its citizens, New York City has failed to critically assess and engage in the restructuring of its affordable housing policy since the 1970s. The 421-a program is a remnant of this era’s tax abatement strategy for developers that was initially seen as a means to boost the affordable housing market in New York City, but it now facilitates the proliferation of building turnovers due to market pressures and loopholes favoring developers. The result of this and other policies is a notable increase in substandard construction, unimaginative circumstantial design - and a decrease in the quality of living spaces. While the 421-a has contributed to a difficult policy environment, the recent reduction in required minimums for living spaces from 400 square feet (established in 1987) to 260 square feet (pending) by Mayor de Blasio has created new opportunities for innovation in design. This has resulted in a micro-unit housing fever throughout New York City, which has become a leading model for addressing urban housing shortages, providing living spaces to the 60,000 who have applied for affordable housing. Simultaneously, there have been productive investigations into mass timber as a viable and ecologically sustainable means for constructing multi-story buildings, even towers. Studies show that the embodied carbon footprint of composite timber construction is 60-70% lower than standard reinforced concrete construction. By investing in raw materials and investing in an ethic of sustainable tree harvesting, we are developing new methods for capturing and storing carbon, reducing CO2 emissions, and creating low impact, highly efficient assembly techniques. The creation of new jobs based on natural resources necessitates craft laborers for construction, and the new architectural typology, the micro-unit, requires a further understanding and appreciation for proximity – as both, studies have shown, evidence positive psychological effects on those living in them. Thus, we can see the intimate relationship between a material and the way it engages its neighbors as promising grounds for new communal living models and a new form to the City of New York. This image and text was shown at Storefront for Art and Architecture's Work In Progress exhibition which opened September 27th, 2016. 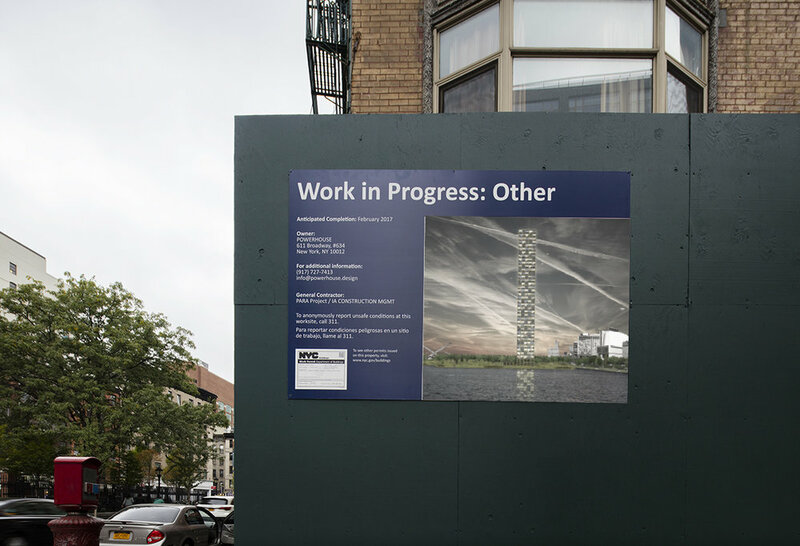 Storefront invited a group of artists and architects to each select a current "in progress" construction site in the five boroughs of New York City, and to offer a critical alternative. Installation photos by Naho Kubota.